It’s finally “done” and uploaded! Here is my entry in the 2012 Nintendomax Wii Dev Competition (my other game, Time Frack 3D, is clearly not going to be done in time)! Hero City 2 is the sequel to last years super hero game. It features improved graphics, an unlimited draw distance, more enemy types, improved combat, structured gameplay with actual objectives and tons more. 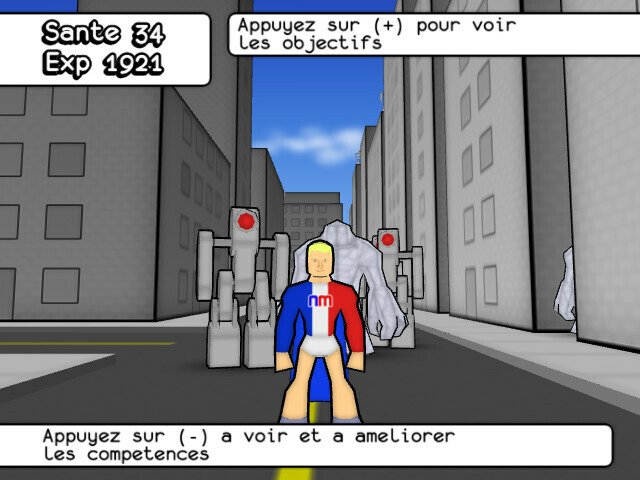 There is even a bonus mode with a first person view. hey, are you planning to make an english version of this game? Yeah. I’ll be updating the game and English text will be among the things added. The original idea was to have all of the text externalized, have a menu to let people choose from multiple languages and to get people that are actually fluent in those languages to revise the translations for me. But then I ran out of time and I had to just post what I had before the contest ended.